A lot of parents tell me they are waiting until their children are older — like the 4-6+ range — before taking them to theme parks. When I was pregnant with my first daughter, I felt the same way. I thought I would NEVER want to take a baby or toddler to a theme park. After all, wouldn't it just be miserable chasing after a toddler or dealing with a baby in the heat and crowds, all for what? They won’t even recall the visits when they get older, right? Caroline’s first visit was around six months old. She was not able to do much but our family was in town from the West Coast and we wanted to spend time with them, so off to the parks we went. To my surprise, it was a great experience. Not only were we able to watch our niece and nephews have fun but they loved spending time with the newest member of their family at Disney World. Watching her cousins interact with her in the happiest place on earth was well worth the trip. Six months old is young but as your little one starts to toddle and gravitate toward their favorite Disney characters it is so worth the visit. Aside from the family time, here are a few other reasons why Disney is perfect for the toddlers in our lives. 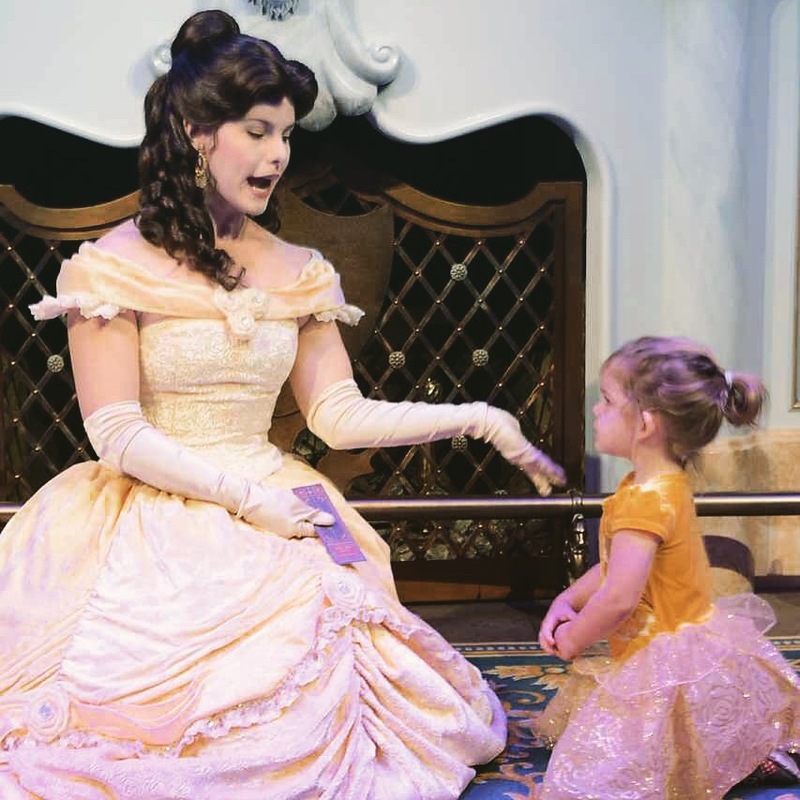 Princesses and Character Spots: So, I am not sure how little boys react to this aspect of a Disney visit, but my daughter was OBSESSED with meeting her favorite Disney characters. This is basically what we spent much of our time doing. So I always got fast passes for the princesses and other characters I knew she would go nuts over. As a Momma, my heart melted EVERY time my little girl turned into a little fan girl when meeting Minnie Mouse or Belle. It is seriously the cutest thing ever, and they LOVE it! The photos are so adorable and if you have a photo pass it is even better because you can focus on enjoying the moment and not taking the pictures. When she was about to turn three, Caroline was obsessed with Moana so we took her to Hollywood Studios to meet Moana in person. Oh, my gosh — it was so cute! She showed Moana how she could do the hula AND sang to her! Moana took extra time with her to make it extra special and memorable. Seriously, the best day ever for her and us! Naps: When you have toddlers, it is very likely that they still nap during the day (if you are lucky) and at the park, they can nap right in the stroller. We often would just walk around when we knew she was tired, waiting for her to succumb to the vibrations of the stroller and snooze. If we were staying on site, we sometimes would go early in the morning and leave at lunchtime for a nap, then return to the park in the evening. It was a perfect way to experience the park and have some peace and quiet to re-enter midday. Having an Annual Pass (Read more about our Annual Pass Experience) also makes this easy because it is no big deal if you decide not to return and just lounge by the pool the rest of the day. You have less of a feeling of needing to get your money’s worth out of your ticket that way because you know you will be back. Sights and Sounds: Typically, toddlers and babies are hyper-aware of new sites and sounds. Disney has so many great shows and parades that will keep your toddlers excited and entertained. Caroline LOVED watching the parades at Magic Kingdom and going to the Beauty and the Beast show at Hollywood Studios. Disney has so many great shows, parades and popup performances that each park area is filled with great toddler-friendly entertainment enjoyable for adults, too. No rush: Unlike big kids, toddlers don’t know what they are missing by taking their time. If you get on a ride or town they are happy. Heck, Caroline was happy seeing a Princess or two, riding Cinderella’s Carousel at Magic Kingdom, and then calling it a day. She was too little to realize that there was WAY more we could have done. But as a parent visiting a theme park less is ALWAYS more. Just watching them take it all in: This alone was enough reason for me to become an Annual Pass Holder when my oldest daughter turned two. Going to the parks and watching your child's reactions of pure joy is all worth it. Moral of the story: Sometimes doing anything with a toddler can be intimidating. Lots of parents will put off traveling or even leaving the house, but there is always a silver lining when traveling and experiencing things with your kids. Tantrums or no tantrums, there will be stress involved but the joys, experience and lifelong memories are worth taking the chance and stepping outside of your comfort zone. So get out there and visit Disney with your toddler — what are you waiting for!